Designing a video game room in your house dedicated solely to the love of playing games can offer some unique and fresh decorating ideas. For some rooms, the space can be completely transformed to make the play experience more comfortable and enjoyable, while in other circumstances the room must be able to quickly adapt to multiple functions. Many games enthusiasts take the opportunity of showcasing their love for popular movies, televisions, and other forms of entertainment, in addition to playing video games. Other games rooms are more traditional, focusing more on boardgames, pinball machines, and non-electronic games of yesteryear. 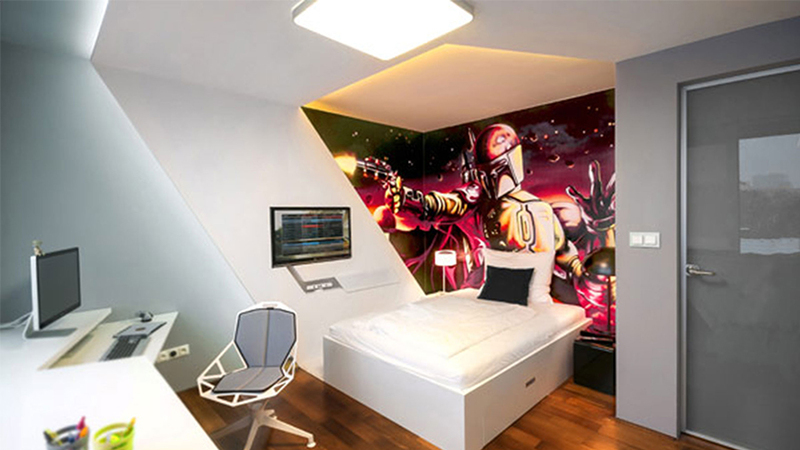 Whatever your budget, or ideas about how to design and decorate a room for gaming, use the chance to express yourself freely, indulging in whimsical wall art design, fun, festive colors, and plenty of memorabilia or collectibles. Kitchens, bedrooms, and other common spaces must often be decorated according to determined compromises between style, function, and taste, whereas rooms dedicated to gaming can be given a freer hand, where zanier and more personal statements can be indulged. The secret to coming up with a quality room for games room ideas is to remember the spirit of play is at the heart of the space, so feel free to try out quirky, colorful, and energetic decorating concepts. A lot of video game enthusiasts are also fans of the Star Wars franchise. If this applies to you, a great video game room idea is to use the concept of a light saber to create unique lighting. 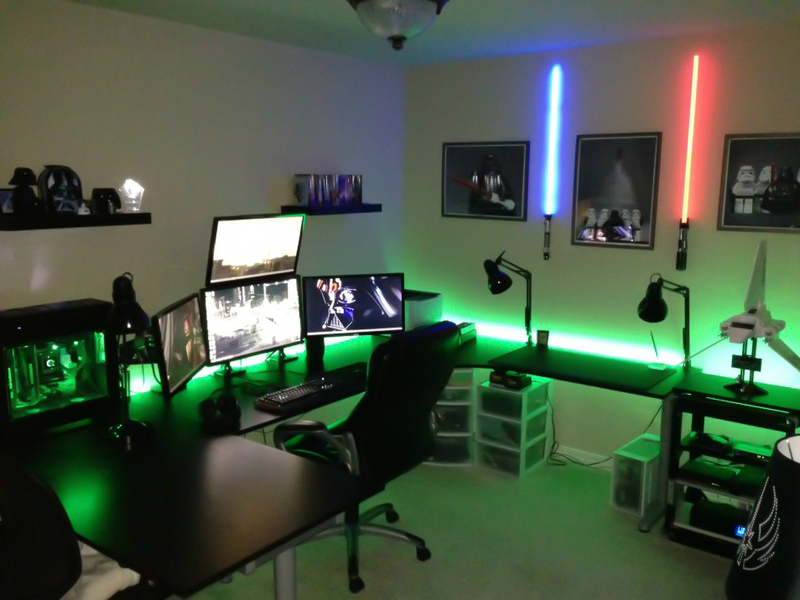 As pictured, two light sabers function as wall sconces, while a saber-esque green fluorescent lighting along the border of the desk forms a strongly thematic background lighting. Tie the whole concept together with action figures, scale replicas, and other of your favorite Star Wars merchandise to give your game room its own unique stamp. Over the years, serious video game players often acquire a vast collection of their favorite games, consoles, and other assorted merchandise. 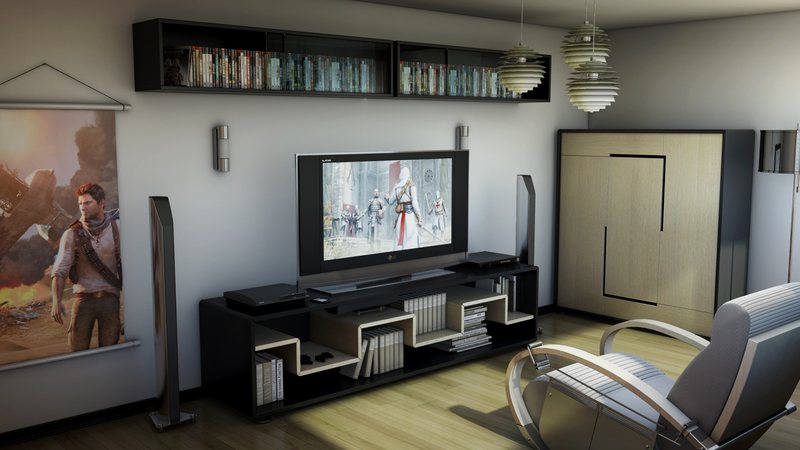 For the serious gaming enthusiast, one of the best game room ideas is to convert a space to an elegant library. Bookshelves, CD racks, and wall-mounted items allow you to properly display and easily access your entire collection. Note the clever use of the mantel above the window, as well as unique thematic lighting in the form of video game manufacturer logos. 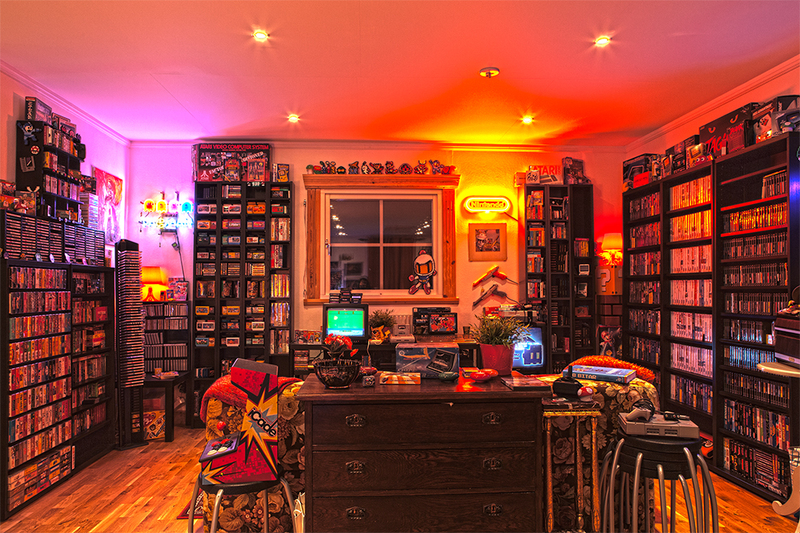 Sprinkle in a few toys and game-related merchandise and your game room library will be a marvelous sight to behold. If your budget can accommodate it, one of the best ways to amplify the gaming experience is to maximize the aural and visual experience. 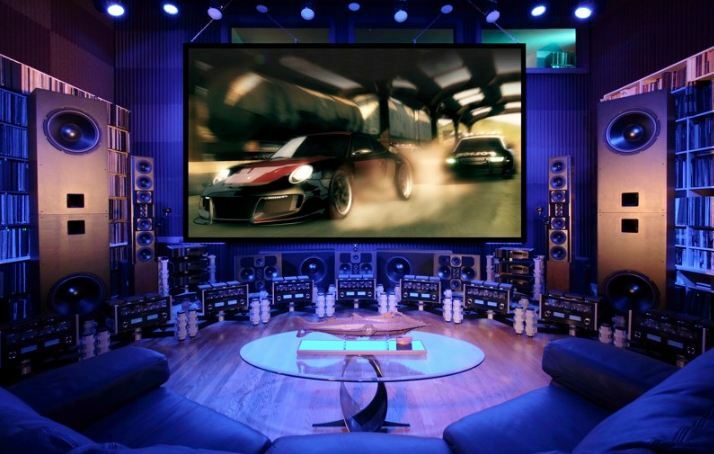 A large viewing screen can definitely wow an entire room of players/spectators, but note the clever game room decor idea of using a panoply of different-sized speakers as a decorative element. With such a large video screen dominating the interior lighting, it’s a good idea to add in a few accent spot lights to help improve the ambient lighting and reduce eyestrain. A circular couch and elegant glass table help tie this room together, with a demonstrative focus on the gaming action. For some players, game room decor is just as important as the games themselves. Instead of creating a cluttered, confined space, this room takes advantage of modern shelving to discretely store games. Two thin tower speakers provide plenty of aural excitement without distracting the eye from the screen. 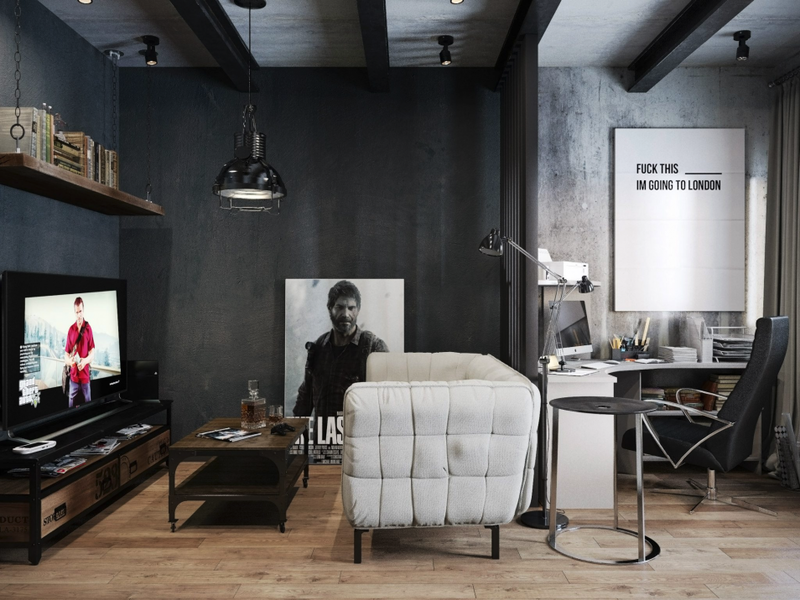 Note the elegant use of a large poster depicting a favorite game, subtly portraying that this interior space is dedicated to gaming. Color-matched furniture in soft earth tones also helps draw the eye towards the black-framed screen where all the action is taking place. Some of the best video game room ideas spring from necessity, such as when a very large screen completely dominates a small interior space. The clever use of parti-colored lights around the door frame, and the strip lighting along the baseboard add just the right amount of ambient background light. A powerful UV light transforms the abundant use of white textures into an otherworldly experience, while the clever use of glow stars on the ceiling adds a vital amount of verticality to this otherwise cramped room. If your budget doesn’t accommodate the addition of gaming-themed merchandise and other items, use everyday items like a flag or framed print to help add additional visual texture to a small space. Some of the best game room designs minimize the fact that a given interior space is dedicated to gaming, allowing greater functionality to the room. Sleek, square white lines keep this room from being visually cluttered, while a few motif touches like statuettes add just the right splash of video game theme to the space. Although the photo reveals an abundance of natural light in the room, it’s always important to take into consideration that the primary illumination source – when playing – must come from the screen itself. A comfortable couch and additional seating elements allow the room to be enjoyed both for solo gaming as well as transforming play into a spectator event. In many houses, making clever use of a low or oddly-angled ceiling can be a real challenge for interior decorators. 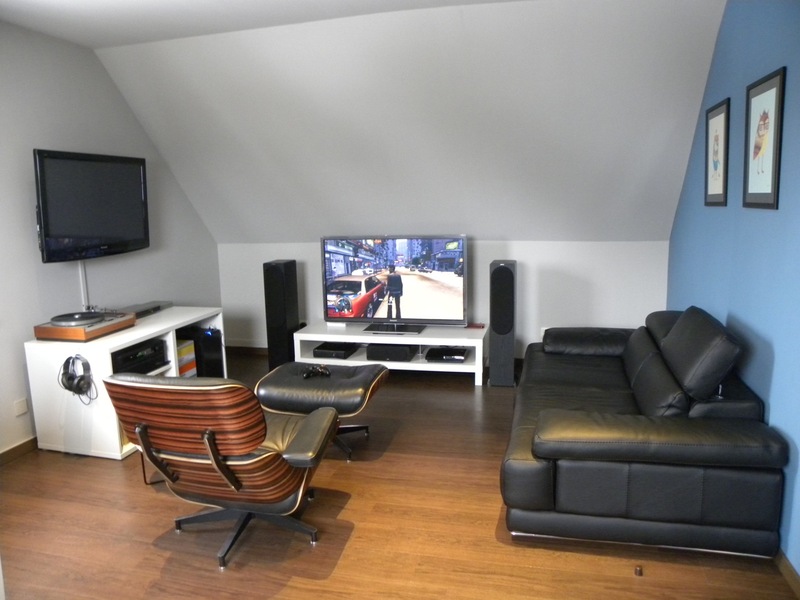 In this image, you can see how this dormer room has been smartly adapted for dual screen use, with half the furniture facing the gaming apparatus and the other half of the furniture facing the traditional entertainment center. A handy footstool and comfortable chair allow for extended gaming sessions, while a matching sofa provides for group settings when consuming more traditional forms of entertainment. The smart use of light colors for the walls in contrast to the darker furniture and speakers naturally draws the eye towards the action on the screen. In this photo, you can see how the video game room decor takes advantage of spherical positioning to draw both the eyes and ears towards the action on the screen. A trio of small but powerful speakers in front blend with ceiling mounted speakers behind to create a truly surround sound gaming experience, while the oddly angled walls are compensated by a clustering of furniture in a hemispheric arrangement, centered on the screen. The light colored walls and shelving framing the screen are nicely contrasted with the clever use of dark furniture and accent pieces, further enhancing the eye’s focus on the action playing out on the screen. In many homes, an existing living room is already dominated by decor designed to focus on the television. In this photo, the existing arrangements have been left unchanged while a desk and chair have been slotted into the corner to add a cozy place to enjoy gaming. By adding in colored lighting in the frame around the television, in conjunction with an elegant floor lamp, an excellent background lighting ambience has been obtained. 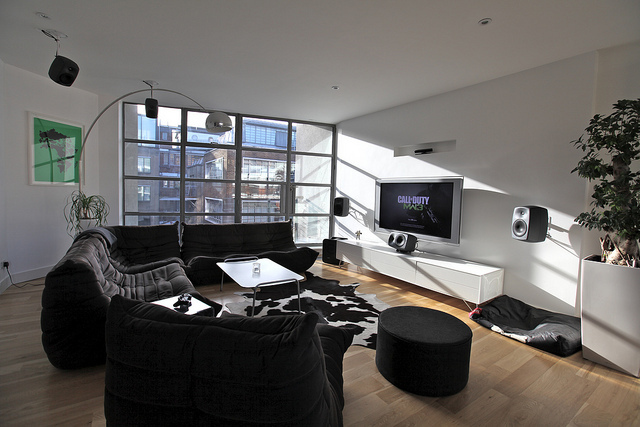 The smart use of accessories, such as the headphones stand, keep the interior space visually uncluttered, preventing gaming paraphernalia from spilling out into the main living room area. 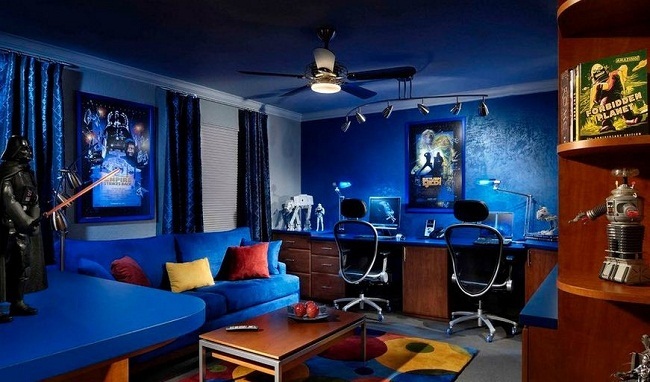 Gaming room design can be a challenge, especially when establishing a theme in an interior space. In this photo, the use of dark blue in the furniture, ceiling, and curtains, adds a unique underwater intimacy to the room. A light mounted in the ceiling fan, in conjunction with staggered spotlights, adds just the right amount of background ambient lighting. Corner shelves and other small unoccupied spaces have been nicely accented with movie and television paraphernalia, adding a small whimsical touch that emphasize that this space is for play. 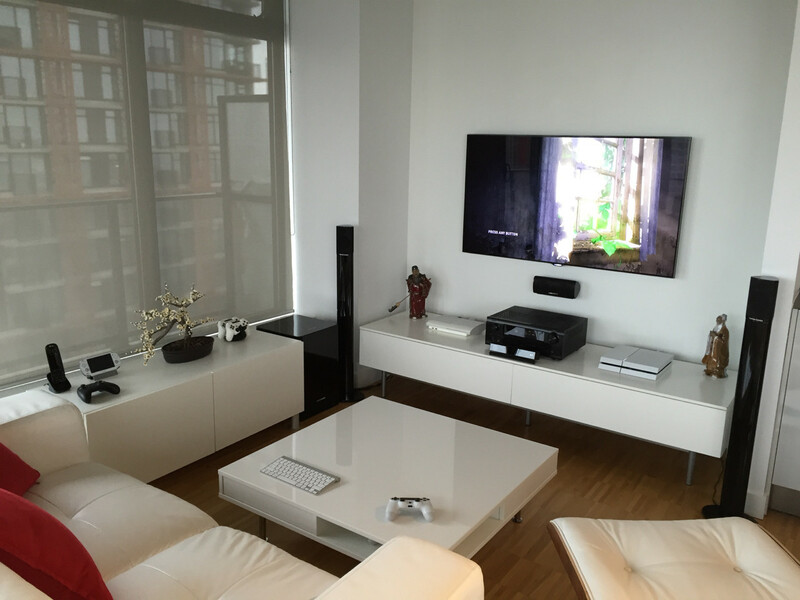 Game room pictures on otherwise empty vertical spaces further help to amplify the intimate feeling of the room. In small play rooms, it can be a real challenge to provide just the right amount of ambient background lighting so that the eye isn’t blinded by the action on the screen(s). In this photo, offset spotlights on the ceiling work together with the recessed lighting in the shelves to help improve illumination in the space without distracting from the action on the screen. Dark colored furniture and other muted color tones will further help amplify the emphasis game play on the screen(s), while a comfortable sofa and elegant table provide for an enjoyable spectator experience. 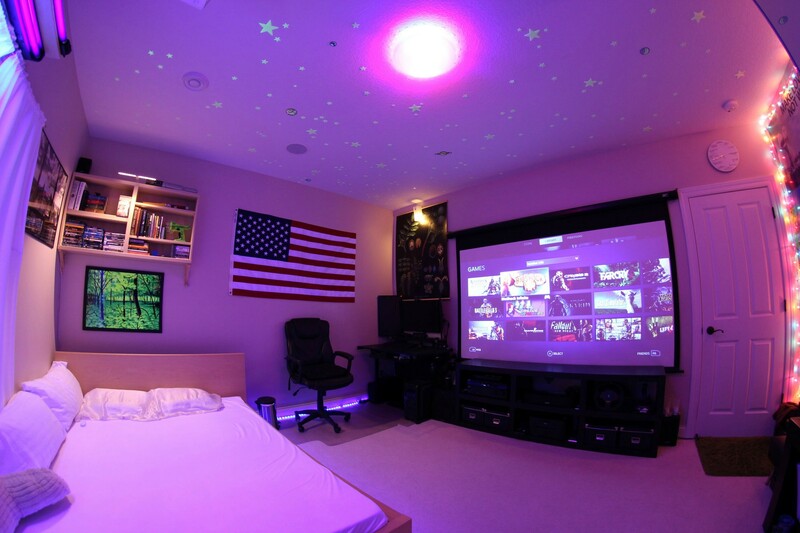 It’s quite often the case that the only available space for an area dedicated to gaming is a bedroom. In this photo, you can see how a large and evocative wall mural on the opposite side of the computer helps maximize the visual depth of this small space while adding a playful theme to an otherwise minimalist design. For increased convenience, a second screen has been mounted on a swing arm for more intimate gaming experiences while in bed. Small personal touches like the sci-fi chair also help put a bold stamp on the space, unambiguously announcing that this is a gamer room. 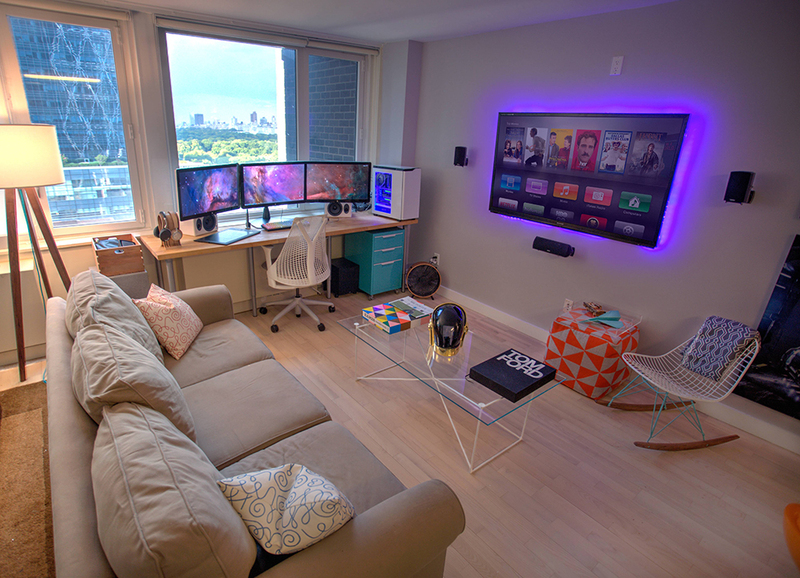 Many people now maintain an office in their home, and this space can be ideal for adding a space for gaming. The clever use of a small divider helps demarcate the line between business and play, while the work monitor is smartly angled to minimize distractions from the gaming screen. The high ceilings are minimized vertically by the use of hanging lights and shelving, thus transforming the game room design into a more intimate experience. Adding a few game room pictures on an otherwise unadorned wall helps add emphasis that this gamer room is for play, while the office decor is contrasted with motivational prints and work accessories. 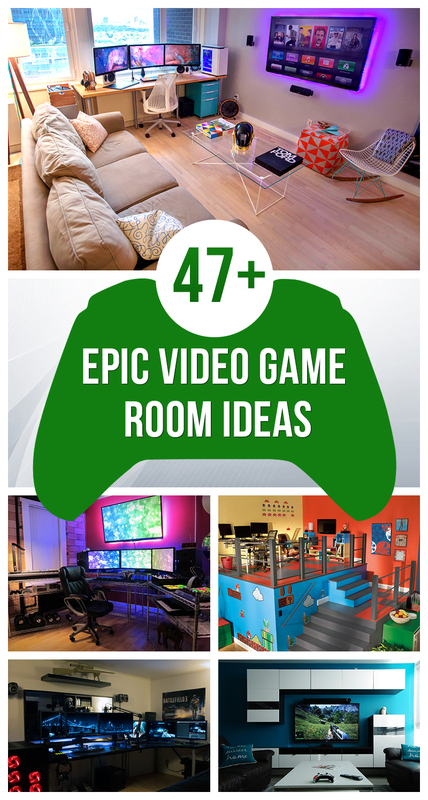 Sometimes the most whimsical game room decorating ideas come directly from the games itself. 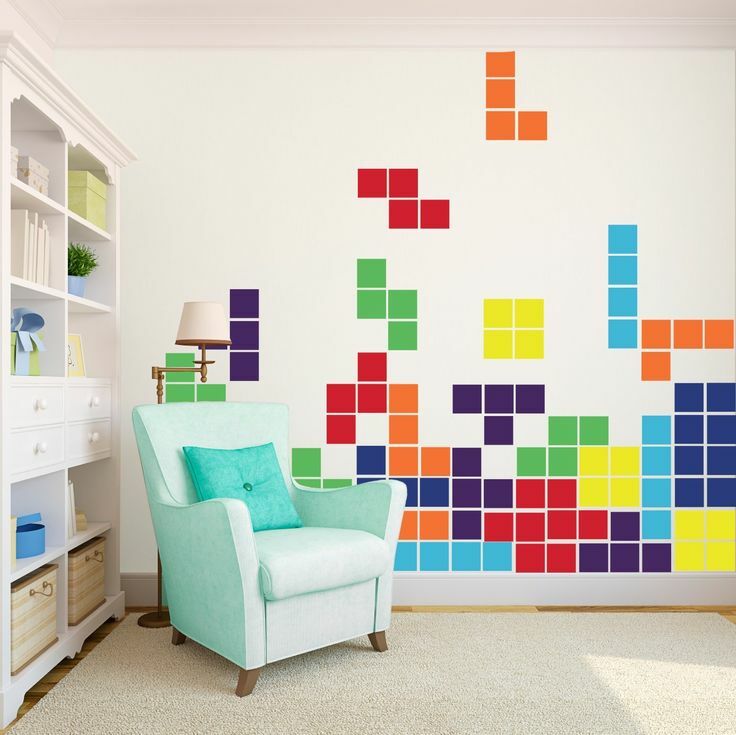 In this photo, you can see how a popular puzzle game has been used as the inspiration for a clever and fun wall design. Buying a few square tiles in a variety of colors, and then affixing them to the wall helps make an instantly bold statement that this space is for play. The smart use of contrasting white, as well as fun pastels for the furniture and shelving accessories, further helps bolster the high energy and playfulness of this play room.